USS Grayback which was a submarine home ported at the US Navy Base, Subic Bay Republic of the Philipines. Late in 1978 we encountered a group of Boat People at sea that had just been through a terrible experience the day before. They had been attacked by Thai Pirates! We first became aware of the situation when our lookouts saw a bed sheet on the boat with SOS written on it and the Captain order the sub to approach it. We put an inflatable boat over the side and one of our officers who was married to a Viet Namese lady and he could speak the Viet Namese language was sent to find out the nature of the assistance needed. The leader of the group on the boat was a former officer in the Republic of South Viet Nam Army and he told us how at gun point the men had been thrown overboard, the women and children raped and brutalized and all their valuables, food, and water looted. After the pirates left the Viet Namese men swam back to the boat and started looking for help. We spotted another Viet Namese boat and this time it appeared that a Thai fishing boat was approaching them. 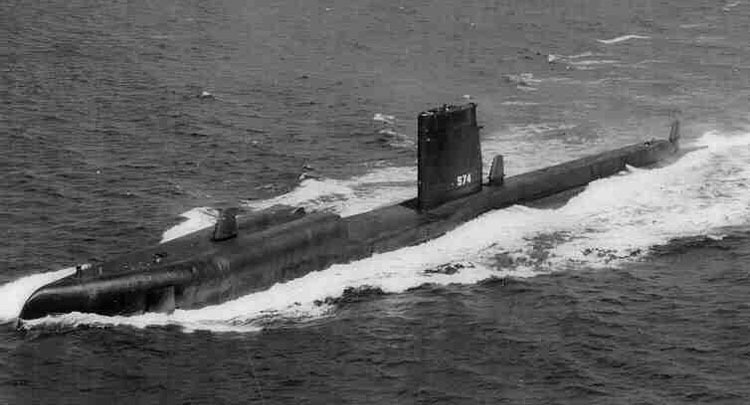 Our submarine maneuvered in between the two vessels and the captain ordered us to mount machine guns in the submarines sail (conning tower). When the fishing boat saw that we were ready for action they took off and didn't look back.